Single Cask Nation Benriach 17yo (53.2%): Let's see what the boys of Single Cask Nation are offering us this time. As you will remember I reviewed their 12yo Arran Malt and 4yo Kilchoman before and absolutely loved them. So, I was pretty excited receiving the sample by mail last week. The whisky is from one of my favorite Speyside distilleries Benriach. It is distilled in 1995 and spent 17 years in a 2nd fill ex-bourbon cask numbered #2522. The cask yielded 225 bottles at 53.2% abv. Color: Incredibly pale for a 17yo. spirit. Like a young pinot grigio. Nose: Damp, muddy peat field. Diesel fuel, sea salt and dried rope mop used to clean the greasy, oily mess of the ship deck. Baby bananas, soft red apples and vanilla custard. Did I just nose some Calvados in the mix? Palate: Massive peat slap on your face. First wave is very dry, oily and peppery with a burning sensation. Adding a few drops of water makes it much more enjoyable, more like slowing it down. After what I got from the nose I was expecting a salty palate but instead it is beautifully grassy and dusty. It is definitely showing the Speyside character of the spirit, not coastal at all. Red delicious apples, nutmeg and middle-eastern rock candies with sesame seeds and cinnamon. Finish: Dry and smoky... Quite long. Overall: Another great cask from Single Cask Nation. I think it's also their boldest choice among the three cask offerings. 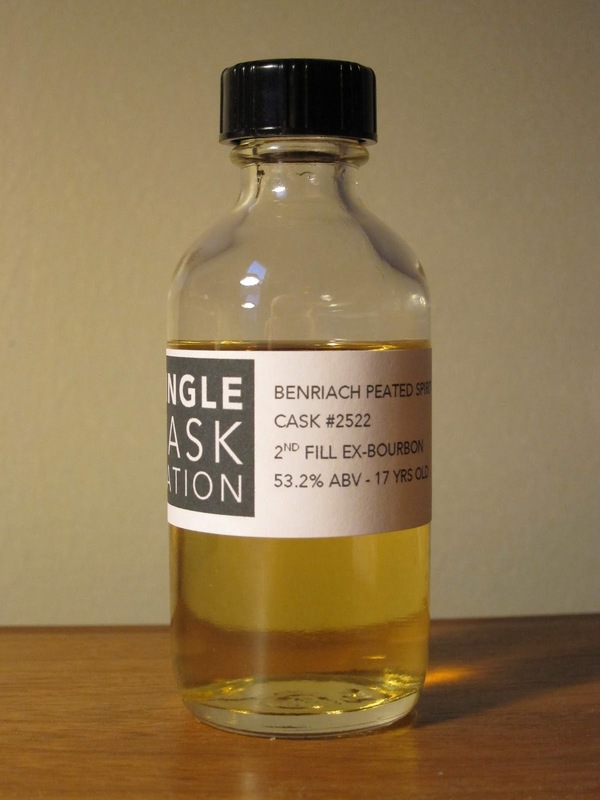 Kind of messes up with your predictions: The whisky is not showing its age in a traditional way and also a quite heavily peated spirit you wouldn't normally expect from Benriach. Perfect choice for the whisky nerds. At the end I can easily say that I liked all of the three expressions they offer in their first year. Great start guys..! It gives us a lot to be excited for.